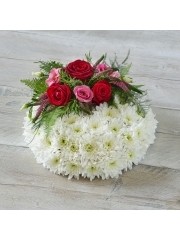 Our collection of Flowers Aberdeen Sympathy Flowers are a perfect way to convey your feelings of sympathy to someone. This collection of bouquets and arrangements consists of whites, and soft pastel colours which perfectly reflect your feelings. When you come to Florists Aberdeen you will never be disappointed as we work hard to bring you the best customer service and the highest quality flowers possible. 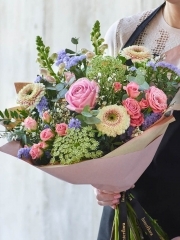 At Flower Delivery Aberdeen we care very much about only ever using the highest quality flowers possible in our bouquets and arrangements, we know that even one bad flower can spoil what would otherwise be a perfect bouquet and that's why we always check over all our flowers to make sure that they are perfect. In order to make sure that our flower are such good quality all of our flowers come for the gorgeous country of Holland. 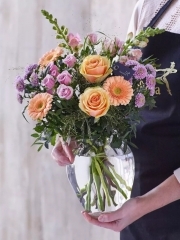 Flowers from Holland are some of the finest in the world and that is why Flowers Aberdeen use no other flowers in our bouquets and arrangements. Only using flowers from Holland is a demonstration of how dedicated we are to quality. As well as the beauty of our flowers we are also very dedicated to how fresh our flowers are. We know that there is nothing worse than having beautiful flowers only last for a few short days because they weren't sent out as fresh as they could have been, which is why Florists Aberdeen only ever send out flowers which are as fresh as possible. When we order flowers from Holland we have them sent directly to our Flower Delivery Aberdeen shop so that we know they are as fresh and recent;y cut as possible, what's more we receive the flowers several time a week so that we always have a supply of fresh flowers in our Flowers Aberdeen shop just for you. You won't get finer flowers anywhere else than the flowers from Florists Aberdeen. We are completely dedicated to all those who buy their flowers from Flower Delivery Aberdeen, and this is really shown in our excellent flower delivery service. With our flower delivery service you can have your flowers delivered straight to wherever your recipient is, whether it be their home or their workplace, we deliver flowers 6 days a week. Ordering flowers for delivery is quick and easy, and great for when you have little time on your hands, simply let Flowers Aberdeen know where your recipient will be and the day you want the flowers delivered and we will sort out everything else for you! Our delivery service is second-to-none, it is much better than simply delivering your flowers a day or two after they are ordered as Florists Aberdeen offer same day delivery on almost all our products. 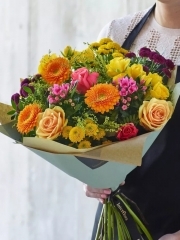 Our same day delivery service is great for when there is a last minute occasion which may have slipped your mind, or if you want to spontaneously send flowers to a loved one. If you want to use our same day deliver service then make sure you place your order before 3pm, to give our Flower delivery Aberdeen florists time to arrange your flowers to our usual high standards. Here at Flowers Aberdeen we are a part of Interflora, the international, trusted network of florists. This means that when you order flowers with us they can be sent to any of 140 countries all over the world. 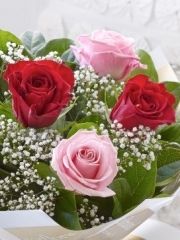 It is so easy to treat your loved ones with beautiful flowers from Florists Aberdeen no matter how far away they live.